We will learn about the best LED strip for our DIY project. 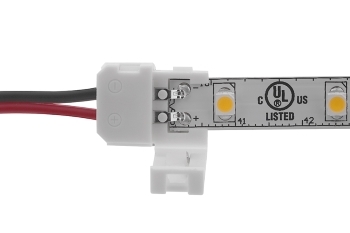 In order to fully connect LED technology very often other items are required such as LED connectors, LED aluminium profiles and LED amplifiers. Moreover, LED strips can be controlled remotely, in which case it is often necessary to obtain all needed components such as LED strips with LED drivers and LED dimmers equipped with a remote control. If you are searching for multi-colour changing LED strip lights with a variety of colour effects, try using the RGB controller. 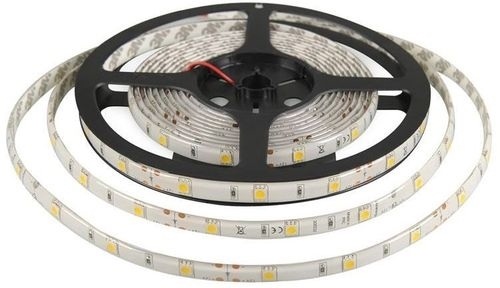 We will explain the main differences between several types of LED strips and their features. There are a lot of different types of LED strips available on the market now so it's quite difficult to find the best for your DIY project. There are analog and digital LED strips. Analog and digital LED strips work differently and produce different results. So, whether you need an analog or a digital LED strip will depend on the DIY project you want to make. Analog LED strips are analog RGB LED strips and monocolor LED strips. Analog Monocolor LED Strips only produce one color. These strips are really easy to wire, they just have two terminals: GND and VCC. You just apply power to the strip, and the LEDs light up. The following figure shows an example of a monocolor LED strip. Analog RGB LED strips have their LEDs wired in parallel. The whole strip works as a giant RGB LED. So, you can light up your whole strip in many different colors, but you can’t control LEDs individually. This means your strip can only be one color at a time. 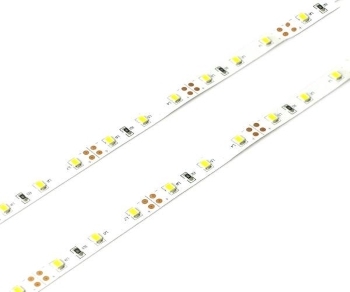 This type of LED strips are cheaper than the digital ones and easier to use. Analog strips are mainly used for decoration purposes. But it really depends on what you intend to do. Analog RGB Strips have four pins which you need to connect. One red channel, one green channel, one blue channel and power. To produce different colors you just need to vary the amount of power to each channel. With digital RGB LED strips you can control each LED individually – they are called addressable LED strips too. You can chose each LED color, its brightness and when they should be on and off. This allows you to do all sorts of crazy and awesome effects. LED strips have a different LED density. The LED density is how many LEDs the strip has per meter. You can find a wide variety of LED densities since 30, 60, 72, 96, 120, 180, 240 LEDs per meter and other options. When we speak about LED strips dimentions we speak about PCB width and LED spacing. LED strips can be water resistant or uncoated. Make sure you keep an eye-out for their “IP rating”. This is the measurement used to rate how ‘proofed’ an LED strip light is against moisture and dust. “IP” stands for “Ingress Protection” – the higher the Ingress Protection, the more protected the light is against the elements. This is a rating used across a variety of other LED lights too, not just strip lighting, such as flood lights and industrial/commercial lighting. The IP rating comes with two numbers. The first number is a rating out of six for protection against solid objects, such as dust. The second number indicates the level of protection against moisture. This is rated out of eight. Uncoated LED strip is not considered to have any resistance to water ingress, but may be rated as IP20 for some physical ingress resistance. Such tapes are generally low voltage and safe for skin to touch but can be shorted by fine metal objects. 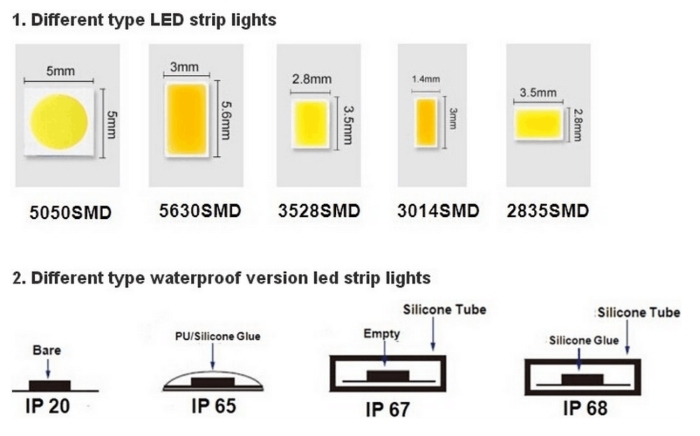 Water resistant strip lighting is covered in a heat conducting epoxy or silicone to protect the circuitry from direct contact with water, and can be rated IP65, IP67, or with suitable sealed connections IP68.However you should be aware that water resistant LED strips shouldn’t be placed inside pools, or in places where they will be subject to agressive weather conditions. Both coated and uncoated LED strips have a two sided adhesive backing to stick to walls, desks, doors, etc. 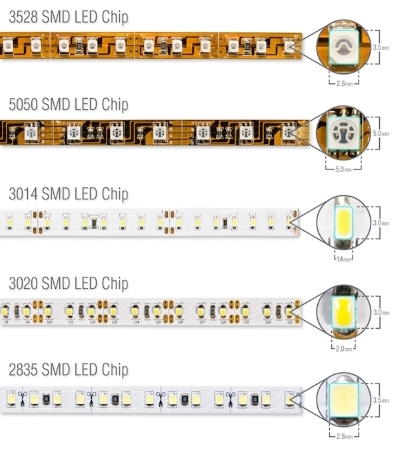 LED strip designs are available populated with many different types of SMD by different shapes, sizes, and power levels. 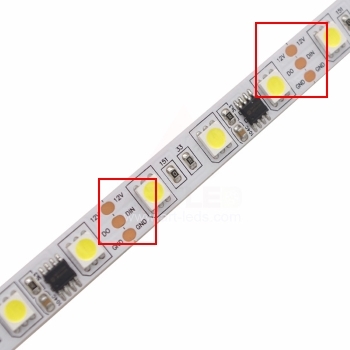 The most common types of SMD are: 3528, single colour, non-addressable, very low power; 5050, containing three LEDs allowing for RGB and addressable strips as well as higher power levels; 2835, a newer single-color SMD having the same surface dimensions as the 3528 but a larger emitter area and a thinner design with an integrated heatsink allowing for higher power levels; 5630/5730, a newer replacement for single-color 5050 SMDs which can operate at slightly higher power levels and have high efficacy. Less common designs may have 3014, 4014, 7020, 8020, or other SMDs. Typical SMD LEDs are rated as having a 120° beam angle, directed "up", i.e. perpendicular to the mounting surface. 'Side View' or 'Edge Emitter' SMDs are designed such that light is emitted parallel to the adhering surface (i.e., 90 degree difference to typical tape design). These allow the construction of LED strips which wash surfaces within less space or accent edge profiles such as signage. What is CRI on LED strips? CRI stands for Color Rendering Index, and is a measure of how accurate a light source is at reproducing colors. CRI is an important measure for LED strips when the appearance of objects is important, for example, retail, under cabinet lighting, photography and high-end architectural lighting. CRI is a convenient metric for determining the accuracy of a light source. In practice, however, minor inaccuracies in color appearance will go unnoticed and may be acceptable for certain applications. In general, 90 CRI or higher is recommended for LED strips used in retail, hospitality and high-end architectural lighting. For professional applications such as photography, 95 CRI or higher may be desired. This is particularly true due to the higher CCT used for these applications, where the light source must come close to mimicking natural daylight. For most other applications, 85 CRI is an acceptable level, especially where cost and efficiency are concerns. Any CRI lower than 85 will begin to be noticeable, and cast a dull, muted light across the entire installation. One particular color within the CRI calculation is called R9, and it provides a wealth of information about how well deep, saturated red colors are rendered. This is particularly important for skin tone rendering. Therefore, we recommend looking for high CRI LED strips that not only advertise high CRI values, but high R9 values as well. The voltage supply is usually marked on the LED strip. LED strips commonly operate on 12 or 24 volts of direct current (DC) from a power supply, sometimes referred to as a LED driver. USB strip lights operate on the standard 5-volt direct current used by USB devices. Mains voltage LED strips are also available. These have the advantages of being usable in much longer single runs without a brightness drop along the length, but are less flexible and heavier due to higher voltage and current ratings and thick coatings for shock safety and high IP ratings in their intended outdoor positions, with limited cut points. No separate power supply is needed, although there must be a rectifier between the mains supply and the end of the LED strip. The most common PCB designs use multiple parallel circuits consisting of passive dropper resistors in series with a certain number of LED SMDs, to operate at a certain current and power level with the expected input voltage. This design is referred to as constant-voltage and is rather sensitive to small variations in input voltage and to the voltage drop that occurs along long lengths of strip when driven from a single power input. Alternative design is the "constant current" design where each parallel circuit of several SMDs includes a small integrated circuit to provide a fix current to that group of LEDs, within a wide range of applied voltages. This allows the strip to operate at the same power level and brightness along its entire length, or with some variation in the driver voltage. LED strips have a power per meter spec too. It means the power consumption of a LED strip. 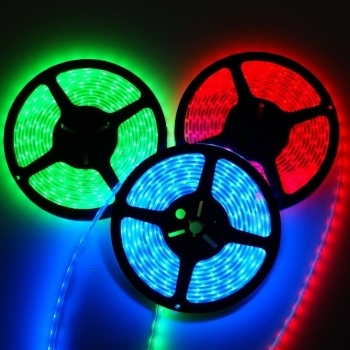 Usually, LED strips come on reels with several meters long and can be cut into small segments. 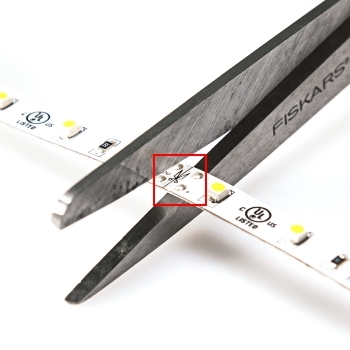 There are cutting marks (One Cuttable Length 25, 50 mm (1, 2, 3, 6 LEDs) ) along the strip marked with a scissors icon that shows you where you can cut your strip as shown in the figure below. One of the big benefits of LED lights is that they are available in different colour temperatures, which means they can cast different shades of white light, so you can have full control over the ambience. One of the big benefits of LED lights is that they are available in different color temperatures of light (Correlated Color Temperature - CCT), which means they can cast different shades of white light, so you can have full control over the ambience. These colour temperatures are measured in ‘Kelvins’ (K). The main Kelvin ratings are: Warm white: 2200-3200K; Daylight: 4000-4500K; Cool White: 5000-6000K. The lower Kelvin ratings cast ‘warmer’ tones which are commonly used in living spaces, such as bedrooms and living rooms. Higher Kelvin ratings, which cast cooler tones, are often used in bathrooms, kitchens and modern surroundings. Lumen is the measurement of brightness as perceived to the human eye. Because of incandescent lighting, we are all accustomed to using watts to measure the brightness of light. Today, we use lumen. 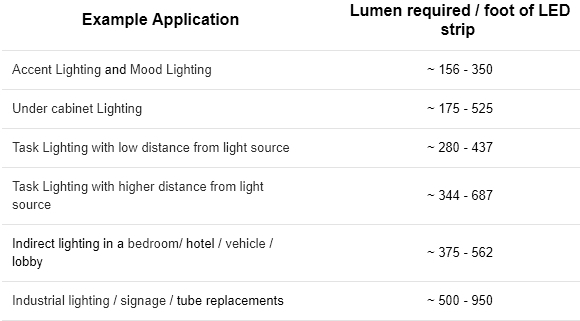 Lumen is the most important variable when choosing which LED strip light you need to look at. When comparing lumen output from strip to strip, note that there are different ways of saying the same thing. The questions you should be asking is “Lumens per what? Per foot, meter, or reel? How long is the reel?” Different projects require a certain amount of brightness to achieve a desired look. Our advice is to always go brighter than needed and add a dimmer. Running your LEDs below their full power and brightness can also increase lifespan.Be careful if the company does not state the lumen output. You will have no idea what the brightness will be until you purchase them. Flexfire LEDs has some of the brightest LED strip lights in the world. If quality is important to you, always request the test data sheets from any company to verify their claims of "lumen output". Using Lumen as the only comparison can be tricky! Some brands over-power their LEDs to make them brighter. Sadly, this will make them fail faster and burn up. 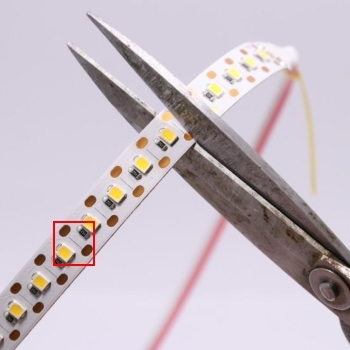 We under power our LED chips to make sure they last longer than rated. 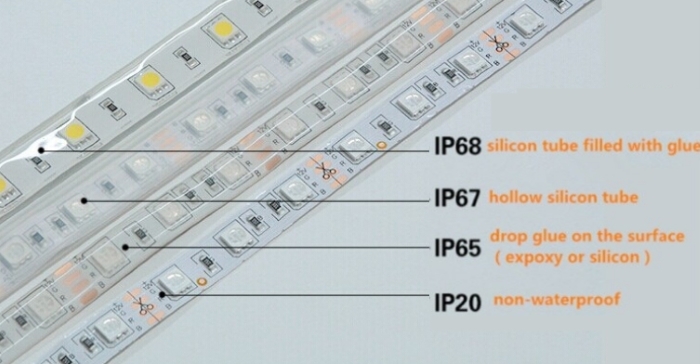 Save this comparison chart and compare with other LED strip lights. How to choose the right power supply? Operating voltage: most LED strips operate with 5V, or 12V or 24V power supply. 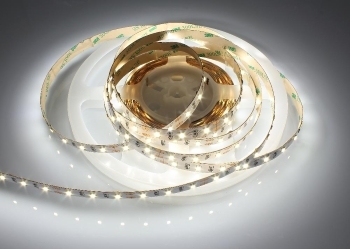 Check the LED strip’s datasheet to find out – some strips have the operating voltage marked on the strip cutting marks. Current draw per each LED chip – check the datasheet to find out. Total wattage of LED strip. You need to add another 20% to avoid potential overload on the transformer. How to control LED strips? Analog RGB Strips have four pins you need to connect. One red channel, one green channel, one blue channel and power. To produce different colors you just need to vary the amount of power to each channel. This is easy to control with any microcontroller using PWM. Whether is using a Raspberry Pi, an Arduino or an ESP8266, you can easily control the LED strip brightness and color. One meter of your analog RGB LED strip can draw approximately 1A per LED pin when all red green and blue LEDs are at full brightness (which produces white). You need a driver circuit to boost the power – add a transistor amplifier in each control line. For example, you can use N-channel MOSFETs like the IRLB8721 that work with 3.3V and 5V logic. So, they are suitable to use with your Arduino or ESP8266. Then, you can control the LED strip with PWM as you would do to control a single RGB LED. 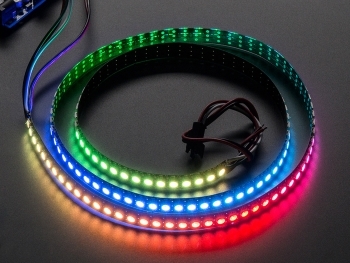 The most popular addressable RGB LED strip is the WS2812B. 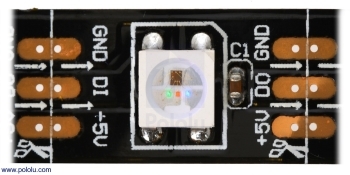 The WS2812B LEDs have an IC built right into the LED – take a look at the figure below. This allows a communication via a one-wire interface. This means that you can control lots of LEDs using just one digital pin of your microcontroller. These LED strips just have three pins: VCC, GND and data. VCC and GND are used to apply power to the strip and the data pin should be connected to your microcontroller. This strip requires a 5V data signal, so you should have no problem controlling it through an arduino digital pin. However, if you want to control your strip using Raspberry Pi or ESP8266 that send signals at 3.3V, you should use a logic level converter module that converts 3.3V data signal into a 5 V data signal. There are libraries that make it really easy to control the strip and make all sorts of crazy effects. For Arduino and ESP8266: FastLED or ALA or Adafruit_NeoPixel or WS2812FX libraries. We have learnt how to select the best LED strip for our DIY project.